Lift and divide overgrown clumps of Narcissus. Replant at the same depth with the foliage intact or wait until autumn. 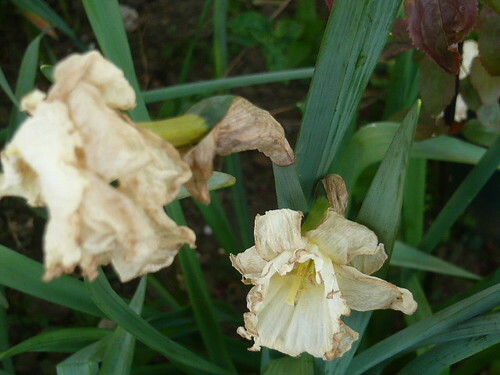 By now your Daffodils will have given good service in the garden and it is time for them to move on. 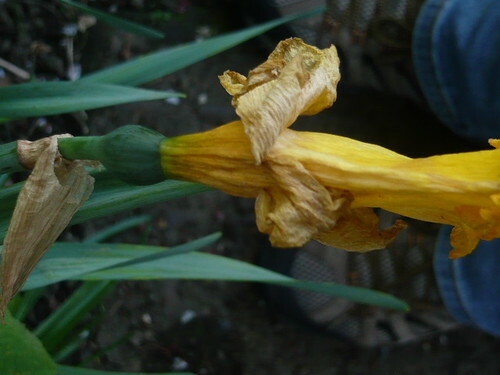 Deadhead Daffodils by cutting or pinching off the old flower and the seed capsule behind the flower. This redirects energy back into the bulb not the formation of seed. Leave all the leaves on the plant. This allows photosynthesis to continue putting energy back into the bulb. Spray or water the leaves with a foliar feed of weak fertilizer (about half normal strength). Do not tie leaves, plat or tidy them with a rubber band. When the leaves start to yellow 8 weeks or so, then it is safe to clear them. If the Daffodils are in the grass you still need to leave them uncut. Give the pruned deadheads a decent burial in the compost heap. Blind Daffodils are ones that haven’t flowered. This can be because they are too immature and need feeding up. It may be that the bulbs have become too cramped and close together. These can be split and replanted but wait until the leaves have died back. Splitting is best be done in September if you can remember where they are growing. Planting your daffodils in a large flower pot which is sunk into the ground. You can then lift the pot and put it out of the way to die back or wait for splitting at the end of each season. Daffodils are Narcissus and all these comments apply to your narcissus bulbs. Always pick plenty of Daffodils for the vase. This is just early deadheading.